Twinfix (Twinwall Fixings UK Ltd) was formed in 1990 and was the first company in Europe to develop a range of glazing bars and fixing accessories specifically designed for installing multiwall polycarbonate sheet glazing. In the mid 1990's we introduced a range of patented modular rooflight systems incorporating multiwall polycarbonate sheet integrated into aluminium framed glazing bars. These systems are sold directly into the new-build markets of factory roof glazing, and canopies in the domestic, education and industrial markets. The system is also widely used in the refurbishment of northlights where Georgian wired glass is failing and needs replacing. To complement this type of product we also design and manufacture aluminium and steel framed shelters, canopies and walkways glazed with polycarbonate. In parts of the country we are able to offer an installation service for these structures, or recommend an installer. In 1999 we introduced a range of fixing products for wall cladding materials, such as ®TRESPA sheet. These products are primarily sold to the same customer base as our multiwall rooflight products. The last few years have seen polycarbonate roof domes and barrel vaults for flat roof applications included in the Twinfix range. Most recently - and because of changing legislation - Twinfix are now suppliers of bespoke Smoking Shelters in a variety of sizes and designs. Today, Twinfix is a large scale stockist of Lexan Thermoclear multiwall polycarbonate sheet, with a service that includes providing ready to fit, cut to size, blown and taped panels. In addition, we also stock solid polycarbonate sheet - ideal for anti-vandal and security glazing purposes. We are able to attract business from the domestic, industrial, mass transit and education markets. 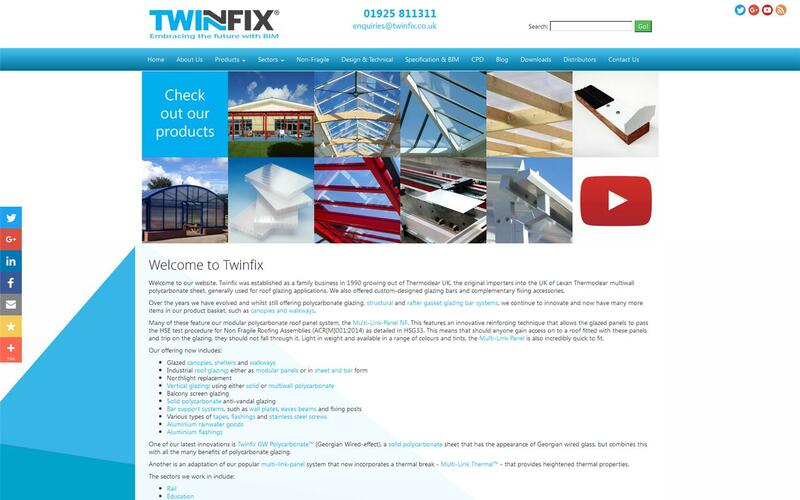 Whilst most of our work is carried out in front of the architect and supplier, Twinfix also offer supply and advice to tradesmen and to DIY enthusiasts. We had nine separate sites in this project, each with two canopies. Twinfix were more than helpful in tweaking the start on site dates to suit our tight programmes when issues arose with preceding sub-contractors or adverse weather conditions. All of our sites were completed on or ahead of contract completion date and this was strongly aided by the help of flexible sub-contractors such as Twinfix. The quality and the general approach to design and attention to detail was first class. Drawings and assistance in design and preparing client details was good and as a company they are very professional.